“Getting hold of them”. The GWR 2-hour Birmingham express accelerating past West London Junction. The engine is a 4-cylinder 4-6-0 “Princess Elizabeth”. IT is probably correct to claim that the highest regular railway speeds in the whole world are run by the famous two-hour- expresses of the Great Western Railway between Paddington and Birmingham. This may seem paradoxical, when the LMS expresses from Euston have to cover 2½ miles further than the Great Western trains in the same time, and when the Great Western itself runs express trains in other directions from Paddington at higher overall average speeds. The explanation lies, of course, in the relative difficulty of these various routes from the locomotive point of view. In the first place, only two of the two-hour trains between Paddington and Birmingham actually make a non-stop run over the 110½ miles; they are the 11.10 a.m. and 2.10 p.m. down. Of the other expresses, the 9 10 a.m. down calls at High Wycombe. All the remaining trains in both directions call at Leamington and for the stop there of three minutes, costing at least five minutes in the actual running, no additional time is allowed. This brings the “net” average speed of the trains calling at Leamington up from 55.3 to 57.7 miles an hour; but as certain of the LMS trains call in the same manner at Willesden or Coventry, this does not altogether explain the necessity for exceptional speeds. The reason is to be found in the difficulty of the grading and the number and severity of the enforced reductions of speed for curves. At no more than three miles out of Paddington the speed of a down two-hour Birmingham express, already travelling, probably, at 50 miles an hour, must be brought down to 15 for the negotiation of the junctions at Old Oak Common West. Then, after the train has climbed from Denham to Beaconsfield and is hurrying down to High Wycombe at 70 miles an hour or so, comes a reduction to 35 miles an hour over the sinuous length of line through the town just mentioned. After more climbing, to the crest of the Chilterns, and a dash at very high speed down past Princes Risborough to the level marches of Buckinghamshire, comes a third reduction, to 50 miles an hour, as we take the facing junction at Ashendon. More ups-and-downs and a long climb past Bicester to Ardley precede yet another “easing”, over the Aynho junction, just as we might have been reaching a high speed again. Such are the obstacles between London and Leamington, all to be surmounted within the brief compass of an overall time of 91 minutes for the 87¼ miles, entailing an average speed of all but 58 miles an hour. To maintain such a time, when the losses arising out of all these speed reductions and gradients have been taken into account, must obviously involve very high speeds over those sections of the line that favour their attainment. From Leamington to Birmingham only 26 minutes are allowed for the 23¼ miles, start-to-stop, and yet as soon as we are through Warwick, no more than two miles from the re-start, the engine is faced with a four-mile ascent, of which three miles are as steep as 1 in 104! As compared with such handicaps as these, the rival route has no steeper gradient than 1 in 330 - save only the first 1¼ miles out of Euston at 1 in 70-105, up which most of the trains receive the assistance of a “banker” in rear - and no intermediate slack other than the 40 miles per hour reduction through Rugby. In such conditions as these it is hardly surprising that the working of the two-hour Birmingham expresses over the Great Western route calls for brilliant locomotive work. It probably could be said of no other train service in any part of the world that the ordinary timings practically demand top speeds in excess of 80 miles an hour if schedule is to be maintained. Yet such is the case on the way to Birmingham by Great Western, where on practically every down trip you may clock an “eighty”’ in the descent from Princes Risborough to Ashendon, with another, if you are lucky, on the way from Southam Road down to Leamington. On the up journey you may anticipate just the same high maxima past Bicester and again in the final dash from Beaconsfield down to Denham, with perhaps a third “eighty” thrown in, so to speak, on the steep descent from Hatton to Warwick. As a matter of fact, in the course of constant travelling by these amazing “fliers”, I have noted maxima of 80 an hour and over at no less than four entirely different points on the down journey and five on the up. The highest speed records that I have ever recorded in 20 years of careful train-timing were made over this route on the very train that is the subject of our study this month - the 6.10 p.m. express from Paddington to Birkenhead - Driver J. Williams, of Wolverhampton, succeeding in getting 90 miles an hour out of his engine on the former descent, and no less than 91.8 miles an hour down the latter, ere we slowed for the Leamington stop! No such speeds are ever needed to maintain the faster and perhaps more famous schedules of the Great Western West of England lines, such as 175 minutes from London to Exeter, the 75-minute run from Swindon to Paddington, or the 105-minute journey from London to Bath, even though these are end-to-end bookings at 60 miles an hour, or even more. The reason is that they are maintained over level or comparatively level lines and, so far as the Swindon and Bath runs are concerned, with no restrictions on speed at any point in the journey. It is within the knowledge of most readers, no doubt, that the present Great Western route to Birmingham is - over its first 60 miles at any rate - a comparatively new one. We have already seen how that famous early engineer of the Great Western - Brunel - preserved the evenness of grade of his main lines by utilising river valleys, but so much at the expense of distance as later on to earn for the letters “GWR” the humorous explanation of “Great Way Round!” So the Great Western Birmingham expresses of years gone by followed the course of the Thames up to Reading and Oxford, and had barely a grade or a slack worth mentioning in the first 100 miles of their journey. Birmingham was 129¼ miles away from Paddington, however, as compared with 113 miles from Euston, and the handicap in distance was too great to admit of any equalising in time of the two routes. When the late London and North Western Railway had at last got its time between London and Birmingham down to the even two hours, early in the present century, the best that the Great Western could manage, without any intermediate stop, was two hours, 20 minutes. Even to-day, if the Leamington stop were made, it is doubtful whether the Great Western could have maintained any less timing over their old route than 2¼ hours between Paddington and Birmingham, which would entail an average of practically 60 miles an hour throughout. It was therefore decided, as it already had been decided and carried out in regard to the South Wales and West of England routes, to “cut off the corner”. 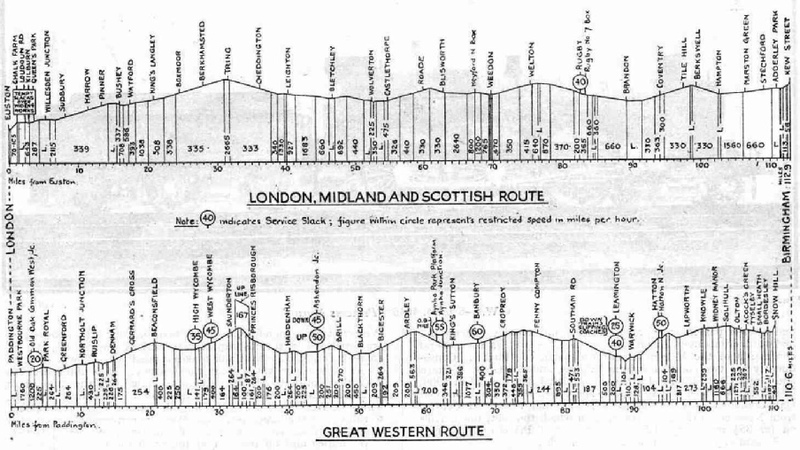 Gradient profiles of the Great Western and the London Midland and Scottish routes, London to Birmingham. congestion of the Metropolitan route north of Harrow. Consequently the two companies joined forces, and the Great Western and Great Central Joint Line was completed and opened in 1906. The Great Western had to make a short connecting line from Old Oak Common, near Acton, to Northolt, and the Great Central from Neasden to the same point, from which the joint line carries on for 35½b miles past High Wycombe and Princes Risborough to Ashendon Junction, in the north of Bucks. From there the Great Western had another connecting spur to make, running forward to a junction with the old Birmingham main line at Aynho, five miles south of Banbury. This was opened in July, 1910, when, for the first time, two-hour expresses began to run between Paddington and Birmingham. Our 6.10 p.m. down “Birkenhead Diner”, then starting at 6.5 p.m, and non-stop to Birmingham, was one of them. It has been altered recently to 6.10 p.m, in conformity with the sensible arrangement of “systematic” departure times, whereby all the Birmingham expresses leave Paddington uniformly at 10 minutes past the hour. Why do I choose this express as the particular one for description? Because it is, in my judgment, the most difficult of the all-the-year-round locomotive propositions on the Birmingham service, which is saying a good deal. It is, of course, the matter of load that makes the difficulty exceptional. The absolute minimum of train formation usually consists first of a 70 ft composite corridor coach and a “triplet” articulated restaurant car set of three vehicles, weighing empty 118 tons (these are attached next the engine and come off at Wolverhampton); a bogie brake, a 70 ft corridor third, two 60 ft corridor thirds and a third-class brake, weighing usually 152 tare tons, for Birkenhead; a slip portion of two 60 ft coaches (55 tons) for Banbury and another 35-ton 70 ft composite slip coach for Bicester. These together make up a 12-coach train to haul out of Paddington, and over the first 53½ miles of the journey, weighing empty some 360 tons. The full weights behind the tender may be taken as a minimum, roughly, of 380 tons to Bicester, 343 tons to Banbury, and 285 tons on to Wolverhampton. It is but seldom that the two-hour expresses of the rival route so much as reach the last figure in total weight, and this is yet another handicap to the locomotives in the maintenance of the Great Western two-hour schedules. It arises out of the fact that the Great Western expresses have to serve a considerably larger area of country than the Birmingham and Wolverhampton districts alone. We have already reviewed the rolling stock on the train, and little more need be said under this head, except, perhaps, to call attention to the articulated restaurant cars. These are built on the same lines as the familiar Gresley articulated coaches of the London and North Eastern, with central bogies supporting the adjacent ends of the kitchen car, in the centre, and the first and third-class saloons flanking the former on either side. This is one of the few Great Western trains, therefore, in which first and third-class passengers are separated in the restaurant cars, and in which, also, the increased seating space available makes it possible to allow passengers to sit in the cars throughout the journey. It is interesting to note that, prior to the introduction of this set, the amount of restaurant car business done on this train in the summer months, while the Wembley Exhibitions were in progress, made it necessary to run two of the large open Great Western restaurant cars coupled together, which was quite a novelty in Great Western practice. We notice also on the rear of the train the two slip portions, each carrying its distinctive array of tail signals. In the earlier days, when the train did not stop at Leamington, there were three - one for Banbury, one for Leamington, and one for Knowle, the last-mentioned being designed for residents in the outlying suburbs of Birmingham. The latter did not appreciate doing without their dinners for the sake of a slightly earlier arrival home, however, and they are now set down at Leamington, and taken on from there by a connecting train that follows the “Diner”. The engine may, and quite probably will be a “Castle” type four-cylinder 4-6-0, but as all my test records on the Birming-ham service have been made by the earlier four-cylinder “Star” class engines (which include, of course, the “Monarchs”, “Queens”, “Princes”, “Princesses”, “Abbeys” and “Knights’’) which often still haul this express, and as the “Castles” received ample attention when we travelled on the “Cornish Riviera Limited”, we will suppose ourselves to be headed to-night by one of the “Princess” batch of four-cylinder 4-6-0’s, with four cylinders of 15-in diameter and 26-in stroke, and 225 lb per sq in steam pressure. Steam is blowing off from the safety-valves when the signal is given to start, but we need not expect any more noise of this kind throughout the journey, as the schedule, the load and the road will between them demand as much of the precious element as can reasonably be generated. As the extensive rearrangement of lines, which has been proceeding for a long time past between Paddington and Old Oak, is probably still incomplete, we may expect cautious running at first. We shall be reminded of the work already carried out by passing through Westbourne Park Station on what is apparently the wrong side of the platform. Then, just as our driver is nicely “getting hold of them”, there comes the reduction of speed over Old Oak Common West Junction, generally involving the cross-over from “Main” to “Relief” lines, as well as the sharp divergence proper on to the Greenford line. 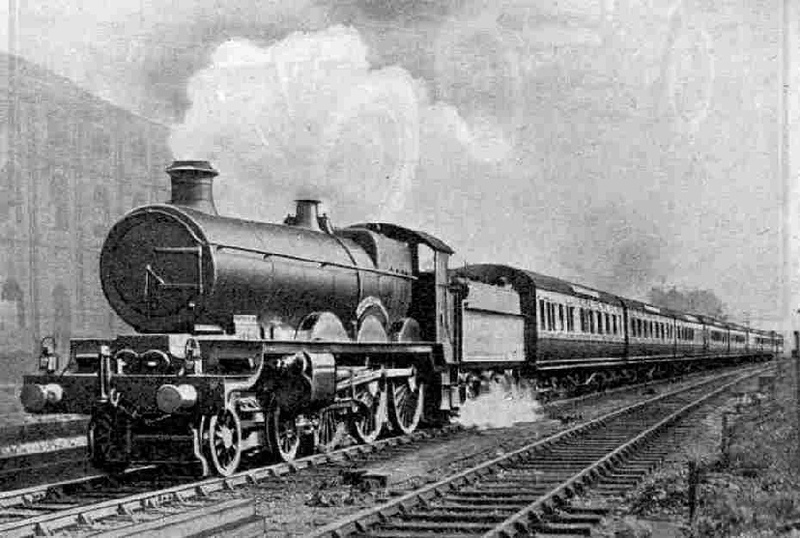 GWR 4-6-0 No. 4046 “Princess Mary”. There is now a rise to Park Royal and a drop to Greenford, where we may expect first to reach the “sixty” line. Despite 2½ miles up at 1 in 261 from there to Northolt Junction - where the LNER line from Marylebone joins us, the down line burrowing under and coming up on our left - we shall fall but little below the mile-a-minute rate, and on the subsequent level stretch to Denham we may get up to 65 an hour. Just beyond Ruislip Station our fireman sees to it that the tender tank is well filled from the “G.W. & L.N.E. Joint” track-troughs that have been laid there. In my judgment this is the most beautiful of all the exits from London, and all the best of the scenery is concentrated in the next 20 miles or so as we thread our way through the abrupt slopes of the Chiltern Hills. From between Ruislip and Denham we rise, first at 1 in 225, then at 1 in 175 and 1 in 264, for 7½ miles unbrokenly, until beyond the golf course at Seer Green, where we breast the summit, just before reaching Beaconsfield Station. Notwithstanding 380 tons of trainload, we need not expect to fall below 50 miles an hour on the climb, and it is quite possible that our “minimum” will be higher than this. But such feats are of so common occurrence on the Great Western Birmingham service that one scarcely takes any notice of them! After threading the extremely deep cutting north of Beaconsfield Station we hurry down the modest descent to High Wycombe, getting a very fine view on the left - if it is still light, of course - when we emerge high up on the east side of the High Wycombe Valley. Brakes go on just before the station for the curves already mentioned, the worst of which are in the next mile beyond. We are now 26½ miles from Paddington, and with a clear road have probably taken 32 or 33 minutes. After Wycombe we traverse a deep valley, bearing round to the right through West Wycombe where a singular station lay-out may be seen owing to space having been taken for a four-track station with centre fast roads and outside platform roads, whereas the platform roads, with a wide space between them, have alone been laid in - and up to the summit of the Chilterns. This is roughly 33 miles out of Paddington, approached by six miles of ascent from High Wycombe, mostly at 1 in 164. The summit we may expect to surmount at between 40 and 45 miles an hour. Between High Wycombe and Princes Risborough a number of traces may still be seen of the old Great Western branch that ran from Maidenhead to Aylesbury. The new joint line replaced this, but the steep gradients and sharp curves necessitated an entire regrading and realignment in order to allow of express speeds over the route. From the Chiltern Summit down to Princes Risborough the down line follows the old route, falling steeply at 1 in 100 and 1 in 87. In order to ease this grade for up trains, however, an independent up line has been constructed, in parts half-a-mile away from the down, with no steeper gradient than 1 in 167. Our enormously rapid acceleration down the steep grade to Princes Risborough will prove one of the most thrilling experiences of the journey, and when we have dashed through that station at over 70 miles an hour - attained from 45 or less in no more than two miles of distance - we shall still continue to accelerate as we leave behind us the imposing rampart of the Chiltern Hills, until we are probably up to 83, 84 or even 85 miles an hour at Haddenham. We passed Princes Risborough a minute late, owing to our heavy load, but although the 9.4 miles from there to Ashendon Junction are only allowed eight minutes, we can reckon on picking up the lost minute on this length. On the previously mentioned occasion of our touching 90 miles an hour at Haddenham we completed this 9.4 miles in six minutes 45 seconds, at an average speed of 83.6i miles an hour over the whole distance. An articulated express passenger train, first and third-class dining car set. The slack over the diverging line to Ashendon brings us down to 50 miles an hour again. The up line, we notice, flies over the LNER main line, which here leaves us for Grendon Underwood junction, where it rejoins the main line over which we travelled recently to Manchester. Two miles up at 1 in 200-251 to Brill are now followed by three miles down at 1 in 200 to Blackthorn, on which we shall once again exceed 70 miles an hour, and possibly touch 75. Beyond Blackthorn comes the six mile rise at 1 in 200 to Ardley, in the middle of which, at Bicester, the first relief comes to our hard-worked engine by the dropping of our first slip-coach off the tail of the train. Once through Ardley Tunnel we have another fall to Aynho Junction - where it is our down line that makes the “fly-over” to join the old main line - but down this the speed is usually moderated somewhat. The second set of water-troughs is here. Five minutes later we dash through Banbury “on time” - 67½ miles in 72 minutes - where we shed a couple more coaches and the load thus shrinks to the nicely-manageable figure of 285 tons all told. There is a gentle rise of seven miles from here to a point midway between Cropredy and Fenny Compton, after which all is plain sailing to Leamington. The first four miles of the descent from Fenny Compton Station are not steeper than 1 in 240, but they are quite sufficient to produce a maximum of 75 an hour, if the driver be so minded. Then from Southam Road follow four miles at 1 in 187, which is a useful “recovery” stretch, if the train from any cause is a little behind time. It was here that my maximum of 91.8 miles an hour was recorded, but we need not expect any such colossal speed on any ordinary evening, and probably we shall not get up to more than 75 an hour at most. For all that, we roll round the long curve into Leamington platform, stopping dead, probably, at a shade before 7.40 p.m. Ninety minutes for a journey of 87¼ miles over such a road and with such a train - wonderful work! At 7.44 p.m. we get away again. With Hatton Bank ahead, the engine is well opened out, and aided by a brief ¾-mile down at 1 in 101, we accelerate with great rapidity, passing Warwick - although only two miles from the start - at a round 50 miles an hour or more. Striking the 1 in 104 of Hatton at about 55 an hour, our rate of deceleration up the bank will depend a good deal on the individual driver, and the minimum will vary between 40 and 47 or 48 miles an hour. After that we accelerate sharply to Lapworth troughs - where a third replenishment of the tender tank takes place - and hurry up the rising grades to Solihull, which include three miles at about 1 in 200, at very little under the mile-a-minute rate. 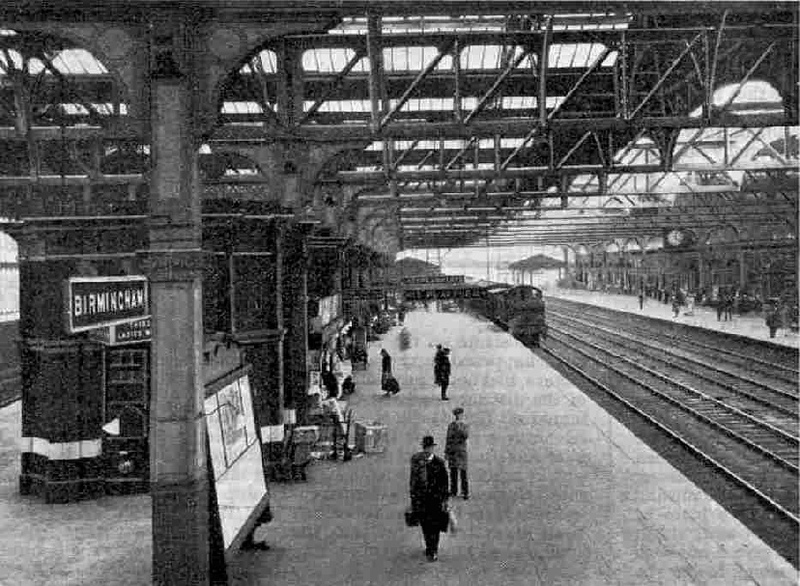 The summit of the rise is turned at well over 60; another lightning acceleration follows to between 70 and 75 over the junctions at Tyseley and, with a final thrilling dash through the underground approach to Snow Hill, we draw up in that magnificent station at 8.9 p.m, with a minute in hand. It would be more or less of an anticlimax to describe the remainder of the journey, as there is little further opportunity for anything in the way of speed achievement and the thrills are at an end. Twenty minutes are allowed for the 12½ miles traverse of the “Black Country” to Wolverhampton, where our hard-worked steed comes off the train, taking with her the leading coach and the restaurant car set. On to the remaining five coaches is backed a two-cylinder 4-6-0 or a 4-4-0 “County”, or, quite probably, one of the handy 2-6-0 “Moguls”, and this works the train over the next stage of 72 miles to Chester, calling at Wellington, Shrewsbury, Gobowen and Wrexham. In the General Station at Chester the train reverses its direction, and with - singularly enough - a North Western tender or tank engine of the LMS (for the final stage is over joint LMS and GWR metals), completes its journey of 210½ miles from Paddington to the Woodside Station at Birkenhead exactly five hours after leaving London. You can read more about “The Cheltenham Flyer”, “The Cornish Riviera Express” and the “Fishguard Boat Express” on this website.